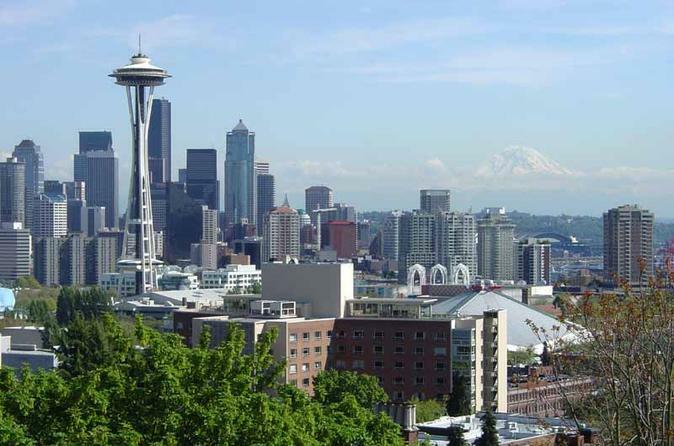 After hotel pickup (only for those staying at downtown Seattle hotels, south Lake Union hotels, or university area hotels), start your 1.5-hour sightseeing tour by comfortable minibus in downtown Seattle. Your guide engages you with humorous stories and in-the-know facts and stats about the city. Tunes from Seattle’s famous musicians, like Jimi Hendrix and Kurt Cobain, amp up the liveliness on board. Weave through the main retail district, and cruise past the culinary landmark of Pike Place Market and the picturesque waterfront. Gaze at Seattle’s oldest buildings in Pioneer Square and learn about the city’s gold rush while passing through Old Town. Then drive through the Chinatown-International District, known locally as ‘ID,' which dates back to the early 1900s. Cruise past the former home of Kurt Cobain and the high school that Quincy Jones and Jimi Hendrix attended. Along Lake Washington, see Governor Albert D. Rosellini Bridge, the longest floating bridge in the world. Go through the hipster-hot neighborhood of Capitol Hill en route to Lake Union, where you’ll see floating homes, including the one filmed in Sleepless in Seattle. Pass the University of Washington and then under a bridge, discover the Fremont Troll, an 18-foot-tall (5-meter) sculpture of a mangy-haired troll with a gimlet eye. At Kerry Park, disembark for a brief photo stop and admire stunning city views. Glimpse the Bill & Melinda Gates Foundation building and Marion Oliver McCaw Hall, home to the Pacific Northwest Ballet and Seattle Opera. Set eyes on Seattle’s most iconic landmark, the Space Needle, before being taken back to your hotel or, if you prefer, one of the select drop-off points in the city.